When stocking your home bar, you have many choices. You can go the traditional route and mimic a professional bar. 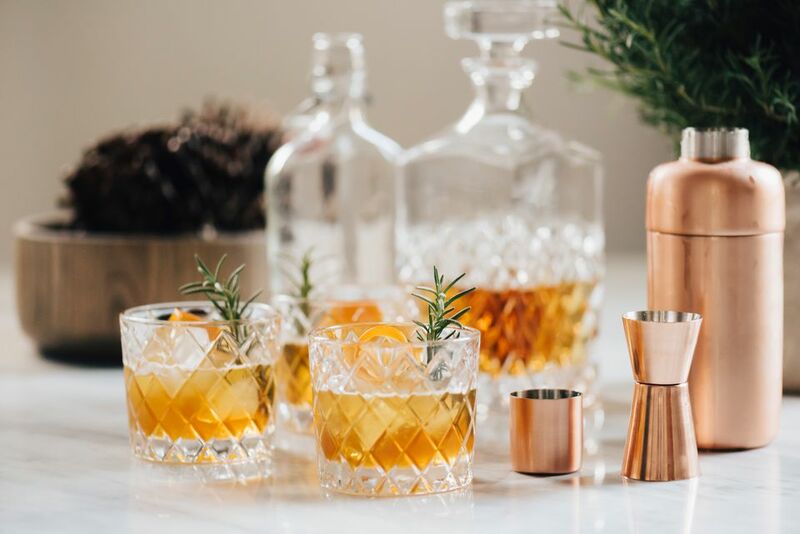 This will include the essential liquors and other ingredients needed for the most popular cocktails and offers the most versatility. However, you don't need to include everything and your home bar should be customized to what you actually drink. If you prefer whiskey over vodka, focus your attention on diversifying your whiskey selection. The same goes for liqueurs and non-alcoholic mixers. After all, there's no need to stock something you are not going to use. Think about what you like to drink and make your bar fit your individual style, taste, and budget. You can always add more as you discover new cocktail recipes or find a new distilled spirit to try. While you are thinking about stocking your bar, you'll also want to think about essential bar tools. These will help you mix those drinks and, again, you can add only what you need when you need it. There are no rules and since it is your bar, it should work for you. At least one bottle of each of the six base liquors will create a well-rounded bar. These are the foundations for the majority of cocktails. Also, stocking a good selection of these will ensure you can mix up almost any cocktail on a whim. If you feel like a whiskey cocktail tonight, you'll be ready. You'll also be set for those times when brandy, gin, rum, tequila, or vodka sound good. Vodka has a clean, transparent flavor and it is used for more cocktails than any other distilled spirit. The market is diverse and you have many good brands of vodka to choose from. Some people like vodka more than others, so stock according to your preference. A good budget-friendly bottle is good for tall drinks like the screwdriver and bloody Mary. If you prefer a vodka martini every now and then, spend a little extra for a top-shelf bottle as well. Flavored vodkas are another matter and you can add any of your favorites. In a traditional bar, citrus and vanilla vodkas are the trusted standbys and good ones to consider when diversifying your bar. Admittedly, not everyone is a fan of gin. However, it is nice to have at least one bottle in every bar. In the least, a good bottle of a London dry gin is recommended. This is the most versatile and can work in everything from a dry martini to a gin and tonic. From there, you can explore gin to your heart's content. Every bottle is different and you can really customize your bar with a fascinating array of the botanicals offered in today's gin market. Tequila is enjoying a new-found glory in the modern bar. If you enjoy exploring margaritas or any of the other fascinating tequila cocktails available, you'll want to stock at least one nice tequila. The most versatile style is a blanco (or silver) tequila. If you'll only be stocking one tequila, that is your best option. If you want a little upgrade, add a slightly aged reposado as well. Today's tequila market is diverse and filled with many great brands. If you can, spend a little more for a bottle that's smoother and more refined. You'll instantly notice the difference in your favorite drinks. A well-rounded bar is best with at least two bottles of rum. A light rum will be your workhorse for most cocktails, from the daiquiri to the mojito. You can spend as little or as much as you like, though rum tends to be one of the more affordable liquors. As a secondary rum, take your pick of a dark or spiced rum. Each has their own purpose and which you choose is going to depend on your taste and the drinks you enjoy. If you really like to explore tropical and tiki cocktails, a dark rum is essential. Things get complicated when it comes to stocking whiskey because each style has its own characteristics and uses. This category is definitely going to need to be adapted to your personal style. In general, two bottles are good to start and you can always add more. Ideally, a bar should have one bottle of each style. For the most versatility and mixability, consider stocking a bourbon and a Canadian whisky. The bourbon will give you that robust whiskey flavor while the Canadian blends tend to be very smooth and the most versatile for cocktails. Rye whiskey is another excellent choice for everyday mixed drinks. Today, we have many great ryes to choose from, though some drinkers find it too spicy. It can, however, be used in almost any cocktail that calls for a generic whiskey. If you enjoy exploring classic cocktails, give rye a try for an authentic taste. A bit more of a specialty, an Irish whiskey and a decent blended scotch are good complements to any bar. While they make excellent cocktails, they're not as common or as versatile as the other styles. However, if you like either, you should absolutely keep a bottle in stock. A bottle of brandy rounds off a well-stocked bar, but it's not necessarily an essential. Some people simply will not drink or mix with it, but if you want to explore classic cocktails, you'll find it very useful. Liqueurs are often used in addition to the base spirits as flavoring agents that define a cocktail. On occasion, they are the only distilled spirits used. Liqueurs come in every flavor you could want and a bottle can last quite a long time. Start with the basics and gradually add to your stock as you see fit. As you explore cocktail recipes, you will quickly realize that some liqueurs make an appearance more than others. These are what we're going to consider absolutely essential for a well-stocked bar. Amaretto - An almond-flavored liqueur that is used in both fancy and casual cocktails. Coffee Liqueur - White Russians and countless other cocktails rely on a bottle like Kahlua. Dry and Sweet Vermouth - Only necessary if you enjoy martinis. Irish Cream Liqueur - Baileys is a popular brand, but there are others worth checking out. You can also stock another cream liqueur such as RumChata instead. Orange Liqueur - Used in countless cocktails, this one's invaluable. Options include curaçao, triple sec, Cointreau, and Grand Marnier, though many bars have two or more bottles in stock. Depending on your drinking style and favorite cocktails, the following liqueurs are good to consider as well. If you're designing a complete bar, a bottle of each will set you up nicely and you'll be able to mix almost any cocktail you come across. Benedictine - A sweet honey and herb liqueur that is smooth and famously paired with brandy in the B&B. Chambord - The iconic raspberry liqueur brand, though any bottle of this flavor makes a good substitute. Crème de Cacao - Comes in different colors and is not too sweet. You can also choose your favorite chocolate liqueur. Crème de Menthe - Minty and either clear (white) or green. Peppermint schnapps is a good substitute. Domaine de Canton Ginger Liqueur - Ginger liqueurs are increasingly popular in cocktails and this is the best-known brand. There are other good brands available as well. Drambuie - A scotch-based herbal liqueur, this is the ultimate companion to your whiskey stock. Frangelico - The best-known hazelnut liqueur, the monk-like bottle also looks great on the liquor shelf. Galliano L'Autentico - An anise and vanilla liqueur, it's not essential but useful for specific cocktails. The problem is finding a place in the bar for the extra-tall bottle. Maraschino Liqueur - A good cherry-flavored liqueur is a good choice and you do have some nice options here. Midori - The familiar bright green, melon-flavored liqueur, this one can be used to create some very fun drinks. St. Germain Elderflower Liqueur - A floral liqueur, this is a shining star in the modern bar and can be used to create many fascinating drinks. 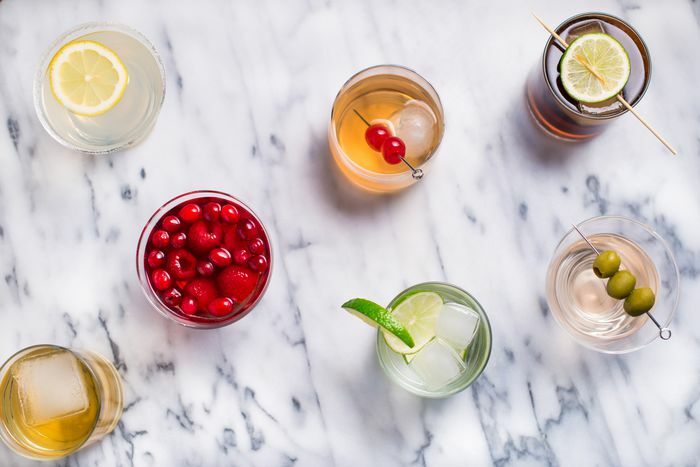 Mixers are the non-alcoholic liquids that add flavor and volume to cocktails. The majority of these will be in your kitchen anyway and are easily found at almost any store you walk into. Many mixers will keep in your bar for a long period of time. However, try to remember to check their freshness and pay attention to expiration dates. Ice is the most important ingredient for cocktails. You will use it in 98 percent of your drinks, either while mixing or in the glass itself. All ice is not created equal, however, and it is important to treat your ice with some respect and know the difference between the various forms of ice. A little knowledge goes a long way to improving every cocktail you mix up. Juices are easy. Simply pick up a bottle or two during your next trip the supermarket. Of course, we're also going to recommend that you use fresh juice whenever possible. However, for everyday drinking, those bottles of ready-to-pour juices are very convenient. Lemon and Lime Juice - Used as accents in too many cocktails to count, these citrus fruits are invaluable in a bar. They're also the easiest to squeeze fresh. Orange Juice - From the screwdriver to the tequila sunrise and countless other cocktails, a good bottle of OJ will instantly diversify your cocktail game. Cranberry Juice - Whether it's for the cosmopolitan or the simple vodka cranberry, this sweet juice is required for many great drinks. Grapefruit Juice - Not essential, but really nice to have in stock. Grapefruit can be used in tall and short drinks and is really nice for summer cocktails. Pineapple Juice - Tropical drinks require a tropical juice and pineapple is the epitome of this. Try to buy small bottles or cans so it's always fresh. Tomato Juice - If you love a bloody Mary, tomato juice is essential. Beyond juice, there are a few more ingredients that you'll want in your bar. We've ranked them in order of importance to help you prioritize. This is where you can save some cash and experiment as well because a number of these can easily be made at home. Bitters - It is amazing what a dash or two of bitters can do to the flavor of almost any cocktail. To start, you'll find that aromatic and orange bitters are used most often and a bottle of each can last years. Simple Syrup - Sugar and water, that's it. This is the best way to sweeten cocktails and it's incredibly simple to make yourself. Sour Mix - Common for tropical cocktails, this brings citrus fruit into the sweet syrup base. Again, don't buy this one because it's the perfect DIY ingredient. Grenadine - That famous red syrup which can be found in any bar, it's essential for many great drinks. You can buy or make this one yourself. Milk, Half & Half, or Cream - Buy one of these as needed because of the limited shelf life (or just raid the kitchen). They're useful for comforting drinks like the White Russian. Coffee - You will find that the best coffee cocktails do not come from a standard drip coffee machine. Try brewing methods that create richer, stronger brew like a French press. Tea - There are many great hot and cold tea cocktails to explore and many types of tea to try in them. Black teas tend to mix best. Tabasco Sauce and Worcestershire Sauce - If you stock tomato juice, these are essential accompaniments. Beyond the bloody Mary, you'll find they add a nice spice or savory flavor to many drinks. Back to a few essentials for any bar, you will want to consider stocking a variety of sodas. The list is simple and includes the basics that you are likely to encounter in recipes. When choosing sodas, try to pick up something other than the most famous brands. Today's craft soda market is impressive and can really upgrade even the most basic of mixed drinks. When buying soda for the bar, try to go for small bottles. Individual servings that work for one or two drinks will ensure you're not mixing with flat soda. Liter bottles are good for the sodas you use semi-daily and will use up within the week, though two-liters are best reserved for party service. Are Pre-Mixed "Cocktails" Worth It? While you can pick up a bloody Mary mix or piña colada mix at almost any liquor store, they are not your best option. These "bottled cocktails" are shortcuts to mixing your cocktails from scratch and they often leave a lot to be desired in the taste department. They also sort of defeat the purpose of creating a great bar in your home. Realistically, the "homemade" versions of a margarita, bloody Mary, and piña colada are not difficult to make at all. They also have a freshness the pre-mixed versions simply cannot duplicate. That said, it's not a bad idea to mix up your own bloody Mary mix from scratch and have that on hand if you drink them often or are hosting a brunch. Realistically, you're probably not going to add a garnish to every cocktail you make in your bar. However, squeezing a lime wedge into a gin and tonic or expressing an orange peel over your martinis can transform the ordinary into a great drink. Garnishes are that finishing touch that adds visual appeal and a splash of flavor to the finished cocktail. Again, it depends on what you plan to make, but this will prepare you for the majority of cocktails. The three citrus fruits are called for as a garnish most often. Have a few of each around the bar and you can use them as both a garnish and a source of fresh juice. Maraschino Cherries - Make your own or try to find maraschinos that are more natural than those bright red, syrupy ones we know so well. Olives - Required for the traditional dry martini garnish. Cocktail Onions - Fun alternatives to olives and the key to turning your martini into a Gibson. Mint - If you're mixing mojitos and mint juleps, fresh mint is essential. Salt and Sugar - If you like the effect of rimmed glasses for drinks like the margarita. Cinnamon - A single cinnamon stick can really add a nice flavor to hot cocktails. Grated Nutmeg - A great complement to many winter and creamy cocktails. Celery or Pickles - The iconic garnishes for a good bloody Mary. Whipped Cream - A dollop on ​top of sweet dessert cocktails is a nice finishing touch.